The overall prices of private properties have increased by 1.7% in 2009. Most of the increases were seen in the second half of the year after a horror start to 2009. The first quarter saw a 14.1% decrease in prices, with only 2596 new units transacted and January being the worst month that saw a mere 100 transactions. The prices decrease at a lower 4.7% in the second quarter, but rebounded spectacularly by 15.8% in the third quarter with over 5570 new units sold - the biggest quarterly rise in 28 years and one that ended 12 dismal months of price decline. Given the rapid pace of price growth and fearing the prospects of a property bubble forming, the Government decided to intervene in September. The interest absorption scheme was removed, which took many property speculators out of the market. The measures dampened market sentiments but could not prevent prices jumping 7.3% in the fourth quarter. Mass market housing was the star segment with record levels reached. URA data showed that non-landed home prices in the suburbs edged up 5.8% in the fourth quarter. This is far lower than the 16.1% climb in the third quarter but it brought the full-year increase to 11.2%. Deep discounts are said to be no longer available in this segment of the market. Prices of non-landed homes on the city fringes rose 9.5% in the fourth quarter and were up 3.1% overall for the year. But prices for non-landed city centre homes were down 2% for 2009 although the 7.1% increase for the fourth quarter points to a recovery. The good response to selective high-end projects launched in the fourth quarter, such as Marina Bay Suites, Cyan and Parvis, had fuelled the price rise. The robust showing since the second half of 2009 seems to have boosted confidence that has carried over to the new year. The Shore Residences in Katong, which was launched on January 1st after a late December preview, has sold 183 out of the 338 units that were released. Property experts believe that prices may surpass the previous peak by the end of the year. Private home prices may rise by about 10% this year, but the mass market segment may see a slightly lower increase. This is because much of the pent-up demand has been satisfied, so there will be less panic or euphoric buying especially in view of the price increases. On the other hand, the high ($1600psf or more) and luxury-end ($2000psf or more) segments should see better upside, as these still trail peak prices by more than 15%. With the scheduled opening of the two IRs this year, and the return of international property buyers into the market, continual improvement in the property sector is expected in 2010, particularly with investment/higher grade properties. This is with the assumption that the Singapore economy continues to improve, and nothing overly bad happening that will cause the world economies to spiral downward again this year. 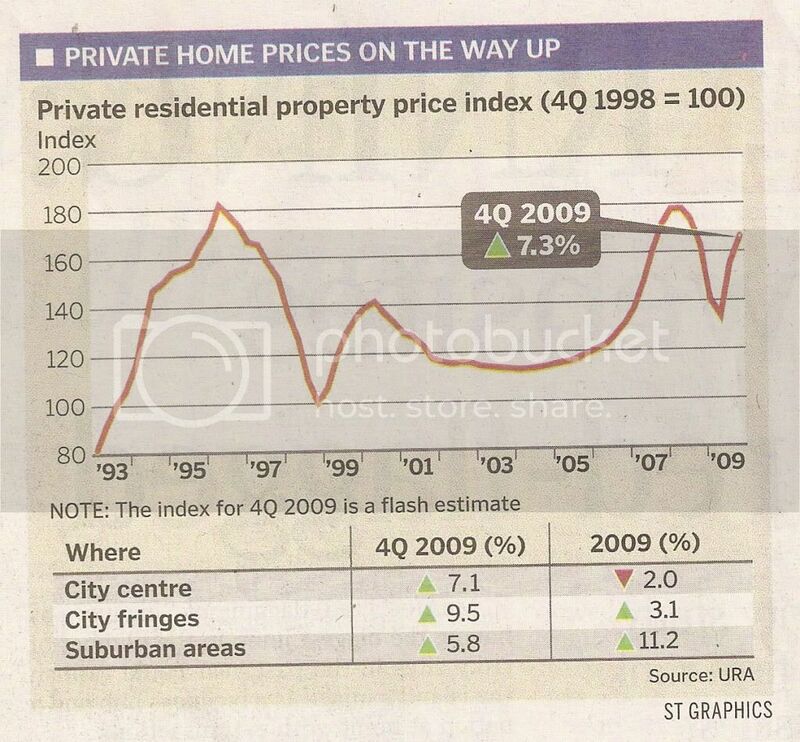 No Comment to " Singapore private home prices increased by 1.7% in 2009 "